Four is the number of stability and manifestation. It represents the visible world and stands for space and orientation. We know the number four in our everyday lives: A three-legged table wobbles, and is made stable through the addition of the fourth leg. We also know the four points of the compass, the four seasons, the four elements, and the four evangelists. 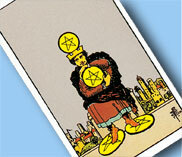 Pentacles — also sometimes called coins or pentagrams — stand for the earth element, thus for materialism and security. 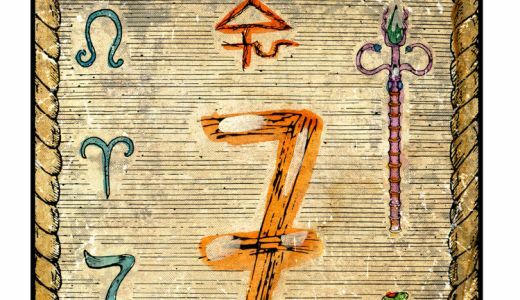 When the value of four is combined with the earth element, then it is clear that this Tarot card has a comprehensive physical meaning. The card is often, due to its stable character, given a negative meaning by many Tarot readers. Unjustly though, since through its meaning of confinement and immobility, we can find the centre of our inner self. Let’s take a closer look at the card: In the Crowley Thoth deck, we first see the pentacles, rendered here in rectangular forms, each on the tower of a fortress. A long road leads to the fortress through two gates, each of which must be passed to gain entry to the interior. Just before the first gate there is the astrological symbol for Capricorn, which represents the sense of reality. Above the fortress is the astrological sign for the sun, which symbolises our earthly consciousness. The same meaning comes forth when we draw this card in a Tarot reading: it shows stability, realisation and security. With the Four of Pentacles, we have the chance to create a solid fundament for ourselves. In matters of love, it can mean a new relationship, or the solidifying of an already existing relationship. Or it shows that our relationship offers a safe harbour. As regards to career, it stands for clear accords and stability. It means, therefore, that we manage our tasks and challenges effectively, and create proper structure and order in our work environment. This can also indicate that our workplace is our “territory”; it is here that we can define our ideas and put them in motion. From the spiritual standpoint, this Tarot card confirms clear relationships and the cultivation of achievements. Unfortunately this card, as with all things in life, has a downside too — especially if drawn in a reversed position. An overly great need for security can lead to a loveless existence, in which we lock ourselves into a fortress and block all new possibilities. The awareness of responsibility that this card indicates can lead to domineering, if we fail to give others the freedom they need. What does the Four of Pentacles mean in relation to other Tarot cards? Generally, the stability of this card tends to confirm the energy of the card with which it is paired. For instance, with a Tarot card such as the Hanged Man it can mean stagnation. 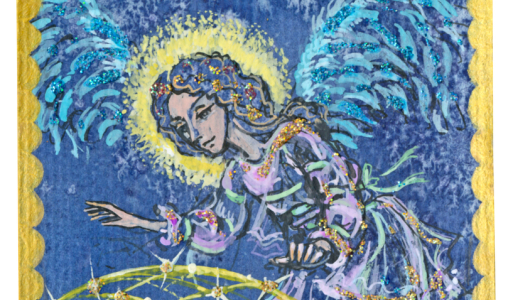 With a card that indicates growth, such as The Queen, it can mean completion. 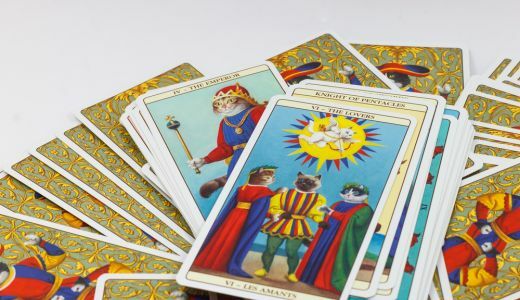 The position of the card in the reading is also essential, since the Tarot can then tell us if the Four of Pentacles is challenging us to develop more structure or is warning us of lack of flexibility. Let us take a look at the same card in the Waite Tarot deck: Here, the emphasis is on the dark side. We see a seated man, grasping fearfully at his coins. He is obviously materially oriented in his thinking, dealing and feelings, and focused on security. One coin is over his head, one over his heart, and the other two under his feet. Here too, the same interpretation applies: the card itself is not the focus, but rather its position in the reading. Only then can we decide how we can constructively arrange our need for security and material balance in our lives.